A web-based application makes our work easier. Especially when we need interaction between screens, we could think about a single page application (SPA). For SPA we may need web-pack or grunt or gulp for merging and bundling your client scripts. Click here for the basics. Suppose if we use ASP.NET Core then we may need to manage packages using npm or bower or yarn etc. so that we can restore packages and compile our application. But, if you don’t have automated CI/CD then your first time deploying a single page app is hard too. 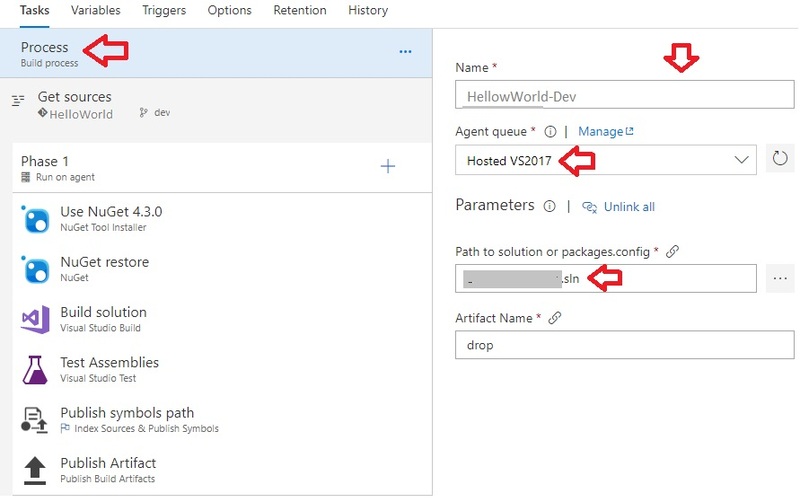 In this article, my main focus is to show you how to create build and release for your ASP.NET Core Applications using VSTS. There was a time when monolithic architecture was a common practice and waterfall model was popular. In this methodology, everything was treated as one big project which was a structural and sequential process. Now, it is broken down into small pieces and it is iterative. Yes, I mean the microservices architecture and Agile methodology. We know Agile is a development methodology. The very word DevOps is the extension of Agile and it mainly focuses on the development process to production support. We can say, this is the combination of software development and operations. Several times in a single day developers check-in/commit and merge codes into a shared repository (Git, Team Foundation Version Control etc.) and after this code merges, it builds and runs automated tests automatically. After code integration, the code is built and tested. Now, it is ready to push your code to staging environment (non-prod testing) or production, but you need manual approver to push it. After code integration, the code is built and tested. Now, without any approval, it is automatically pushed to a staging environment (non-prod testing) or production. 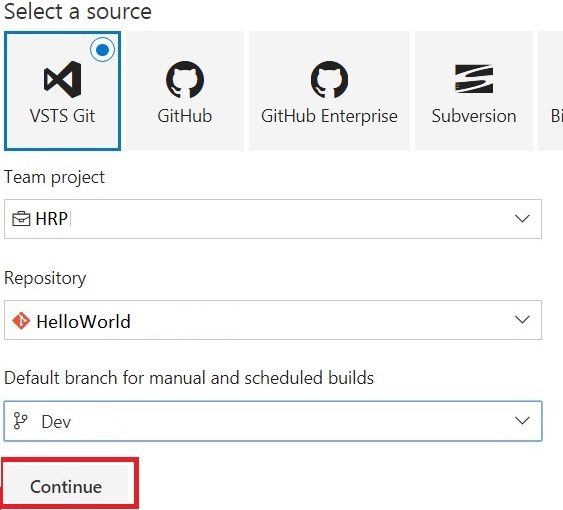 Provide a name for the project and choose the right version control Git or TFVC for your project. Select a work item process. Click on Create button to create the project. Click on Clone in Visual Studio. VS IDE will pop up a window. Click on Clone button. 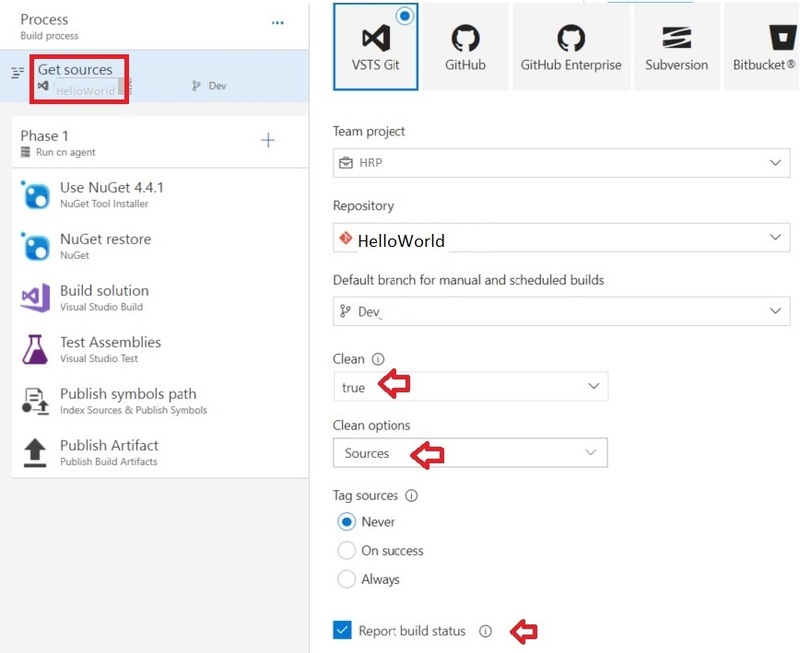 Select Team Explorer and then Click on Create a new project or solution. After creating the project, you need to commit all of your changes. Click on Team Explorer>Changes. Fill the change comment and click on Commit All. Click on Sync to synchronize the codes. 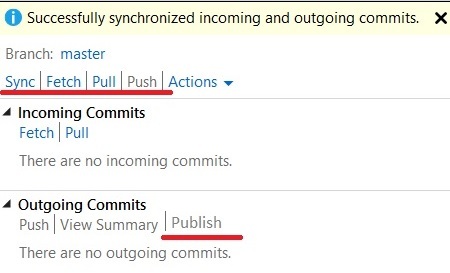 Finally, click on Publish (Outgoing Commits>Publish). 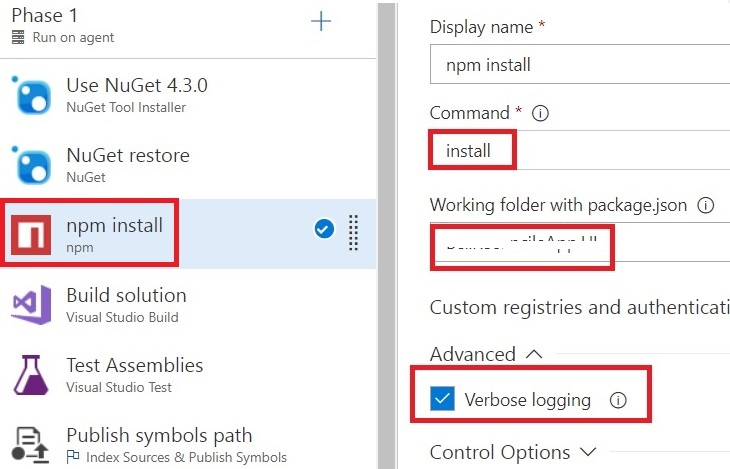 Select the Build & Release tab and Builds. Select New to create a new definition. 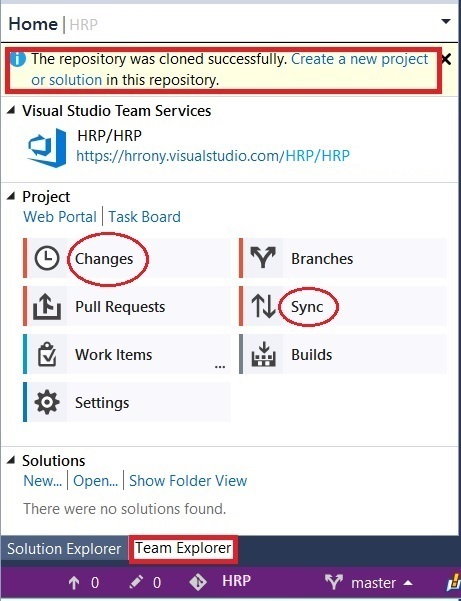 Select Project, repository, branch and then click on continue. Choose a build template according to your project type. 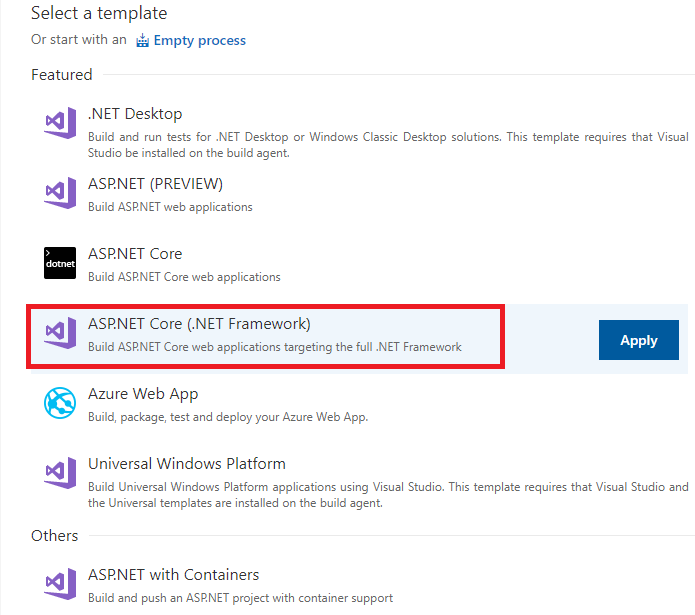 I’m selecting ASP.NET Core (.NET Framework) and click on Apply button for the build definition. 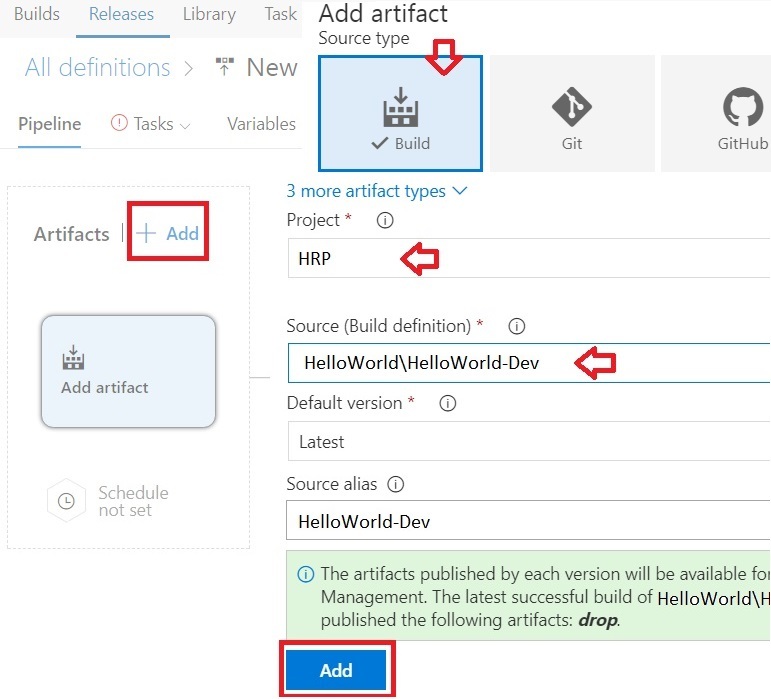 Select the Process task and fill the name of the build definition (Say, HelloWorld-Dev, we’ll use this name in the release). Select Hosted VS2017 for the default agent where you want to run the build. Choose Hosted VS2017 if your team uses Visual Studio 2017 then it has Dot Net core framework and required others components to build the project. Choose Hosted Linux if your team uses development tools on Ubuntu. Choose Hosted if your team uses Visual Studio 2013 or Visual Studio 2015. 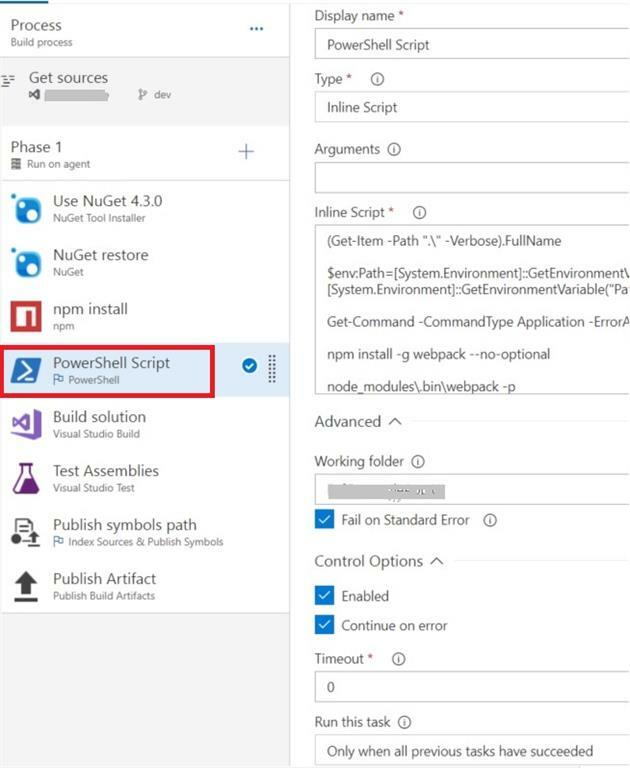 Select the project solution file for “Path to solution or packages.config” and fill the Artifact Name. 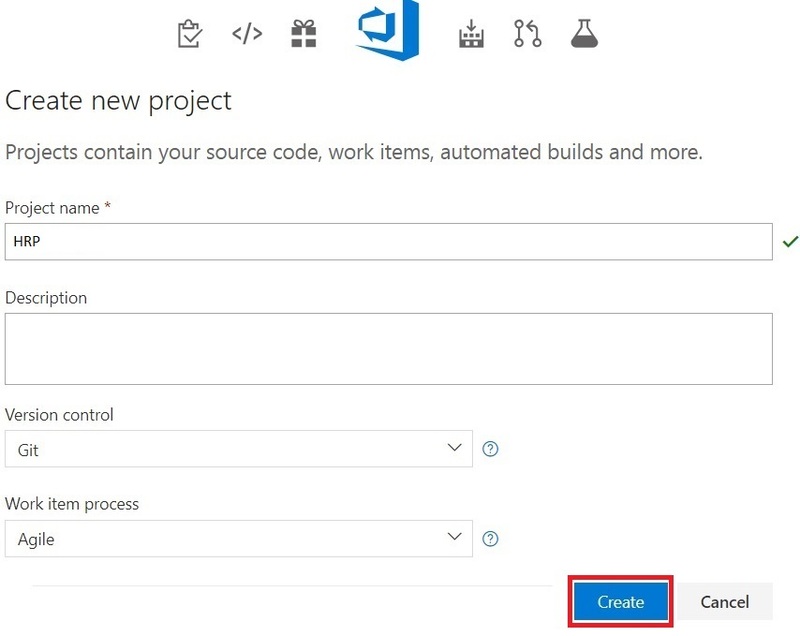 Select the Get sources task and check the correct project, repository, and branch. Select clean: true and clean options: sources. Tag sources: Never. Report: build status. 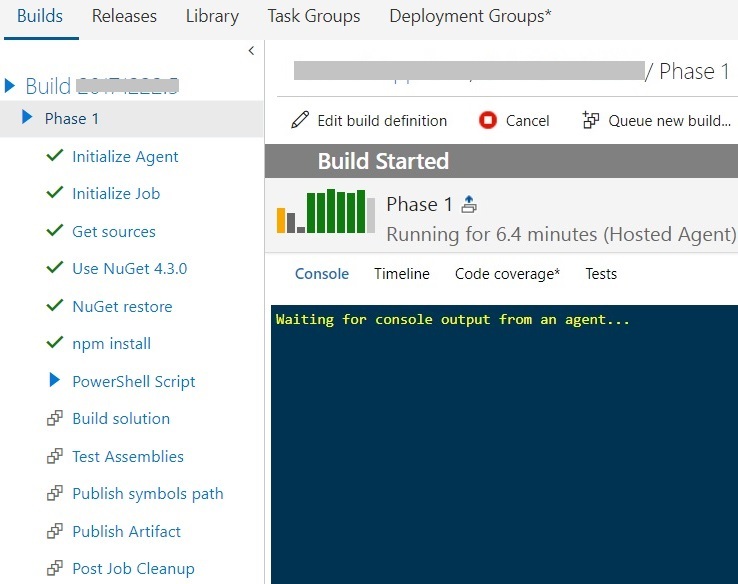 Select Build solution task from Phase 1. Choose Visual Studio Version: Latest. 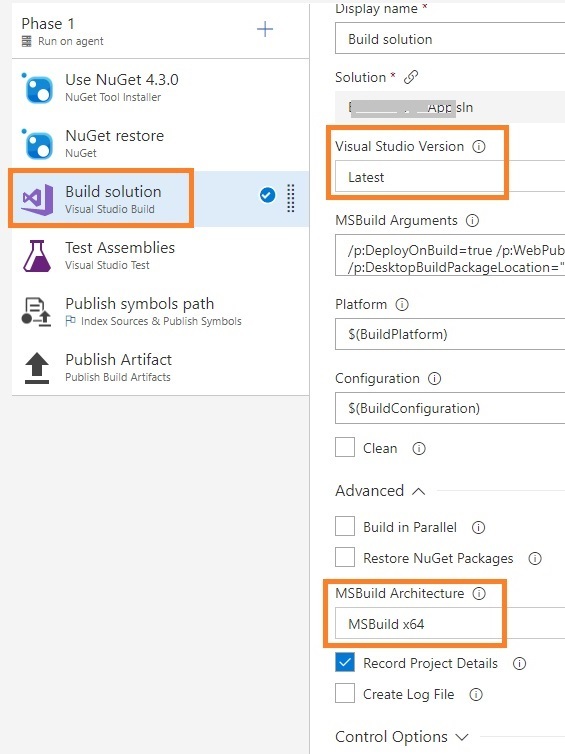 MSBuild Architecture: Select X64 or X86, the right one which works for you. We need to add npm to install all of the packages that are used in our project. To add npm task, click on the (+) Add Task from the right side of Phase 1 and select Package. Find and add the npm task. Now, drag and drop the npm task to place it before the Build solution. If you use Bower instead of npm then you need to add Bower. Now, select the npm task and choose Command: install. Now, for “Working folder with package.json”, select the root folder of the main project where you have a package.json file. Select Custom registries and authentication Registries>Registries to use: Registries in my .npmrc; Advance>Verbose logging: checked; Control Options>Enabled: checked. Advanced> Working folder: Root folder of the web-app where you have webpack.config.js file. Run this task: Only when all previous tasks have succeeded. Select the Triggers tab and select the following information. Select the Options tab and select the following information. New build request processing: Enabled. Automatically link new work in this build: Enabled. Only link to work added to specification branches>Type: Include; Branch specification: i.e. dev. You can also change the default value for Build job. 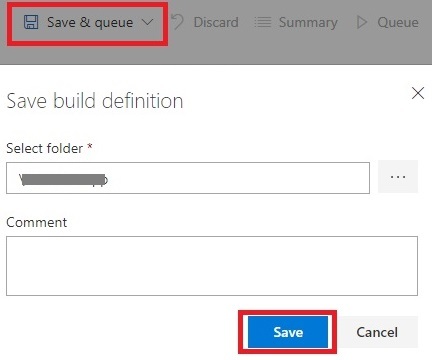 Finally, Click on Save & queue>Save to save the build definition. Now, we have automated CI build if you commit your code changes into your selected branch then you will see the following output. 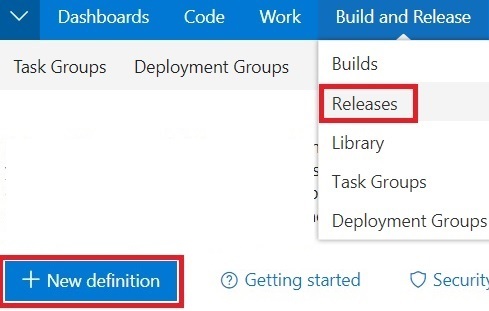 Go to Build and Release tab > Releases > New definition. 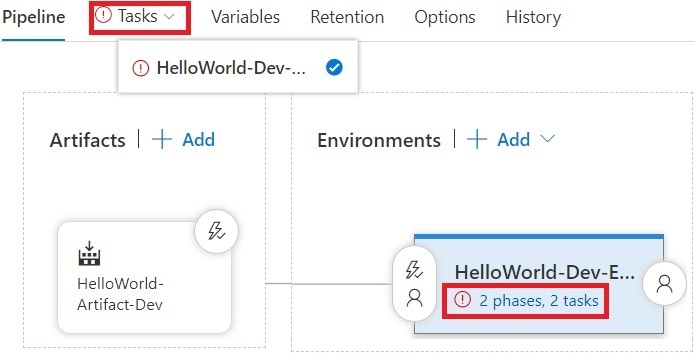 If you already have an existing release then select plus sign (+) and Create release definition. 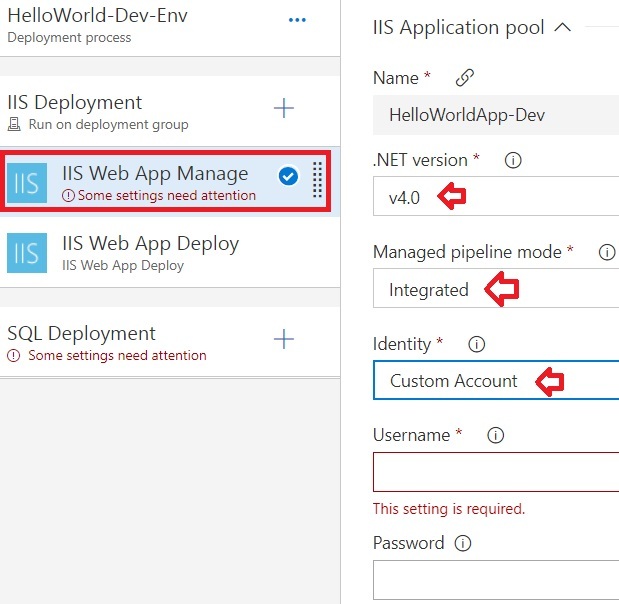 Select a template - IIS Website and SQL Database Deployment. You will get an environments window. Now, change the environment name from the properties. In the Artifacts panel, select +Add and select the Project, Source (Build Definition), Default version and a name for Source alias. Click on Add button. 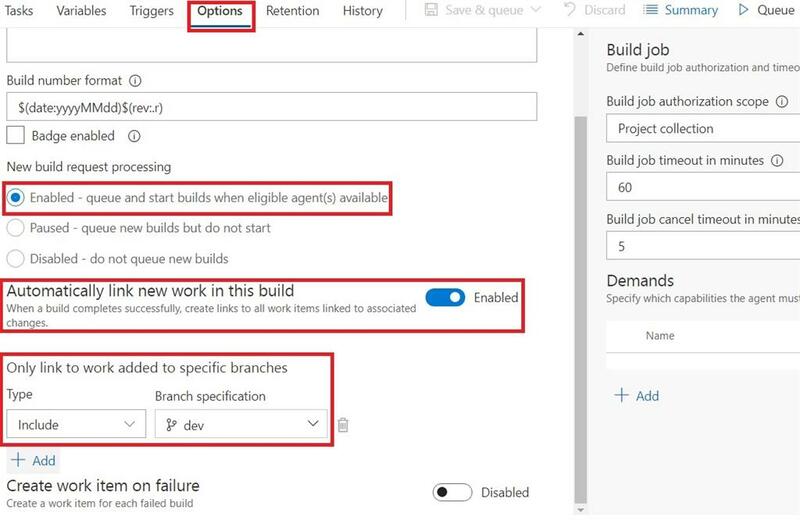 Click on the lightning bolt to trigger the continuous deployment and then enable it on the right. You will need it if you want a new release to be created when a new version of the source artifacts are available. Click on Add button and select the Type and Build branch. Type: Include; Build branch: i.e. Dev; Build tags: leave blank. On the left-hand side of the browser select the tasks or select the tasks (2 phases, 2 tasks) from the Environment panel. 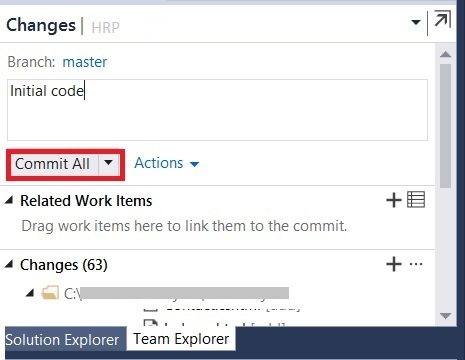 These tasks will perform your deployment process. Protocol: HTTP or HTTPS, Port: your IIS assigned port (i.e. 543) and HostName: i.e. helloWorldApp-dev.yourDomain.com. 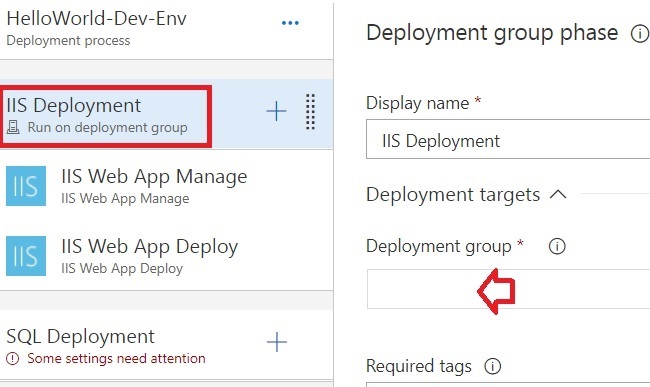 Click on IIS Deployment on the left-hand side and select the deployment group. 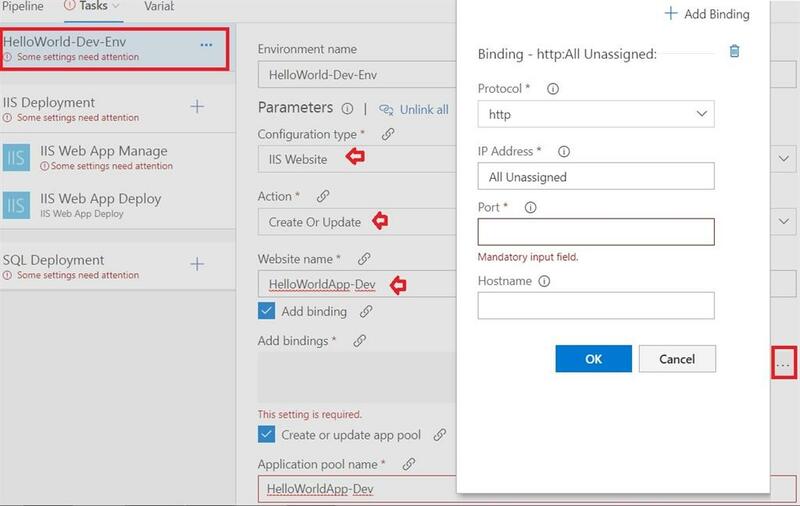 Select the IIS Web App Deploy and checked on the Take App Offline. I didn’t use SQL deployment task. So, you can disable or remove the task if you don’t need it. 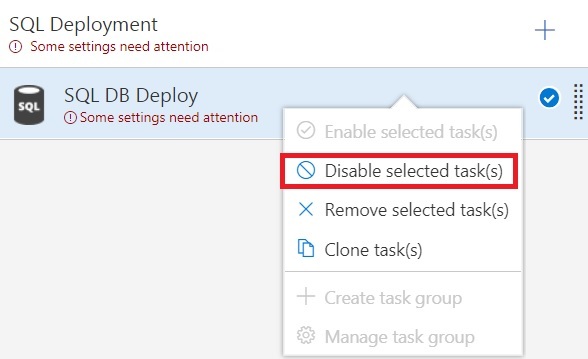 Select the SQL Deployment and right click on it to Disable selected task(s) or Remove selected task(s). Finally, click on the Save button to save the release definition. Don’t forget to set up your IIS configuration.